One of my favorite things to do is organize stuff. Naturally I’m attracted to any sewing project that might help me accomplish this, and a big bonus if it helps me bang out a gift or four at the same time! I wanted to make embroidery kits, my daughter an art organizer case she could take to-go, and an adult coloring book organizer. 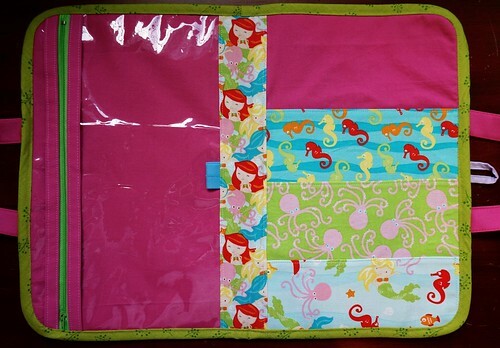 It was basically between Sew Sweetness’ Creative Maker Supply Case and Noodlehead’s Road Trip Case. There were also a variety of free tutorials, but in the end I wanted something I didn’t have to think about or do any math for! 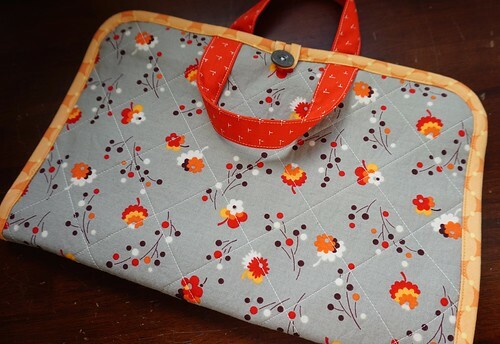 I was making four of these as gifts, and seriously, I wanted something I could brainlessly sew together, so I picked the Road Trip Case. What sold me was her knitting version. I just LOVE it! I will totally be making one of those for myself eventually. Although the Creative Maker Supply Case looks like these knitting organizers on KnitPicks which I love too! 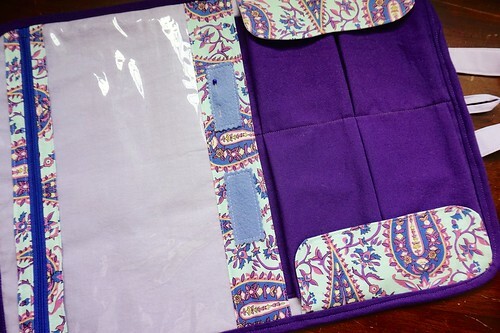 The hardest part was choosing fabrics for each case that coordinated with each other. I pretty much went with what I had on hand, as this is a fat quarter and scrap friendly pattern. 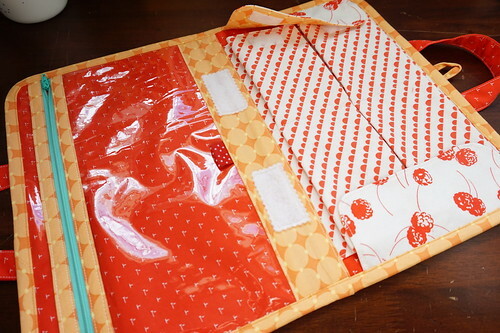 For this first case, I used a fat quarter I’ve been hoarding called Posie by Denyse Schmidt. I decided to just use fusible fleece for the outside (which I used for all of the cases) and quilted with a diamond pattern. I used my walking foot and guide to make things easier on myself. I think it would have a nicer quilted look with batting. 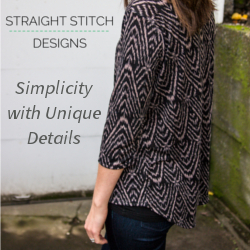 This is the pattern’s alternate version with 4 pockets that are equal in size. I added the little felt rectangles in the middle for needles. 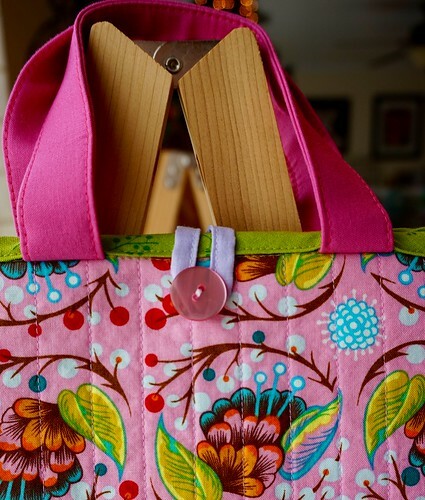 I enjoyed pulling together these fun colors from scraps, and the zipper just pops. For the pen holder, I used some foldover elastic that was red with white polka dots instead of plain white elastic. 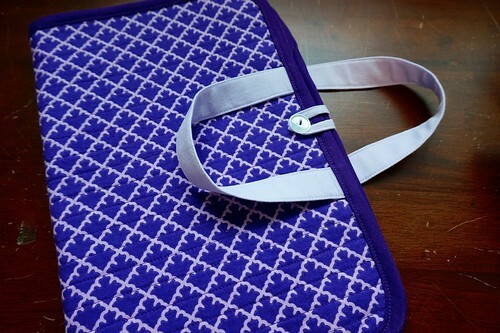 The second embroidery case is the same as the first, but in purple. I quilted the outside with straight lines which seemed to take forever, but I like the look. I used some scrap fabric from a quilt top I made years ago using Amy Butler fabric. It’s Cypress Paisley from her Love collection in mint. I like the small print because it stands out even here. Everything came together very easily with the instructions. I was a little concerned about sewing the zipper and vinyl together, but it was so easy and looks nice. The pockets were simple to assemble as well, and I was very pleased with how they turned out. I think the hardest part was sewing the line in between the pockets straight! I had to redo that once. The art case I made my daughter was even easier than the embroidery kits. 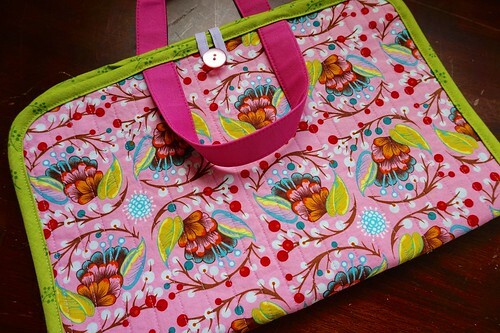 I used some gorgeous Anna Maria Horner fabric I was seriously hoarding with a vengeance for the outside. I adore her fabrics, all of them! This one is from her LouLouThi collection. The inside was a lot of fun to choose fabrics for. 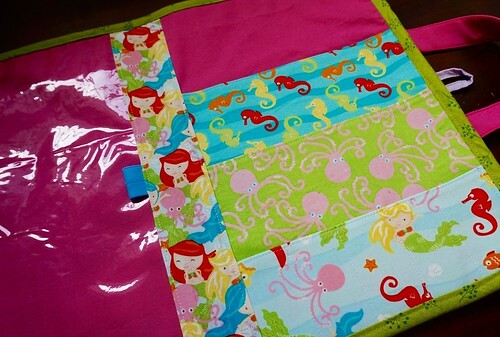 When my daughter was one, she picked out this fat quarter bundle at JoAnn’s that had mermaids and sea creatures on it, and she wouldn’t give it up. She loves to draw, so I knew she would enjoy seeing this fabric in her art case. I made the zipper pocket and center pieces first, then I put them together and measured how wide and tall I wanted the pockets (ok, I guess I had to do some math). I also interfaced the pockets with SF101. I serged the top edge of each pocket, turned it down 1/4″ and top stitched. I decided to add the pocket in front for her markers for quick and easy access. I also added a pen holder using blue foldover elastic. My only thing with the finished product are the way the handles look when being carried. I think they look very unfinished. It’s suggested that they can be turned up and stitched down, but I don’t like that either. I think on my next case I’ll attach them to the outside of the case. The fourth case looks pretty much like the others, so I won’t include pics for that one. Overall, I’m happy with these cases, and my daughter uses her art case all the time. It’s easy for her to carry her art stuff with her when we go out, and it keeps her very busy while we wait for food when we go out to eat. 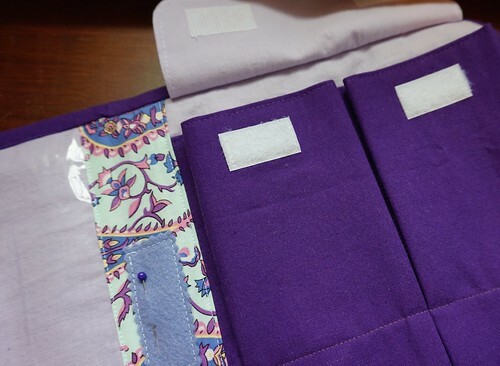 Do you have any organizer patterns you love? Please share, I love to see new ways to organize things!